The history of beads dates as far back as 40,000 years ago. Trade beads have been made by practically every culture since then. Egyptians were making glass beads by 1365 B.C., and several thousand-year old glass factories in Lebanon are still in production. Evidence China has been making and exporting glass beads for centuries has been revealed in archaeology sites. Glass and Brass beads are found in burial sites of many cultures: Egyptian tombs, Roman catacombs, Saxon, African, and American Indian. For over two hundred years, beads were made in Murano by a method known as “winding.” With this method, beads were made individually by drawing a molten glob of glass out of the furnace and winding it around an iron rod. Glass of another color could then be added, or the bead could be decorated with a design. Coloring agents were added to the molten glass: cobalt made blue; copper produced green; tin made a milky white; and gold resulted in red. Wound beads from a master glassmaker were so perfect it was hard to find a seam where the different molten glasses merged. Around 1490, Venetians started to make beads from tubes of drawn glass; Egyptians may have used this process centuries before. With this procedure, a master glass maker took a glob of molten glass from the furnace and formed a cylinder. After working the cylinder into the desired shape, he attached a rod to the cylinder. An assistant took the end of the rod and run down a long corridor before the glass cooled. 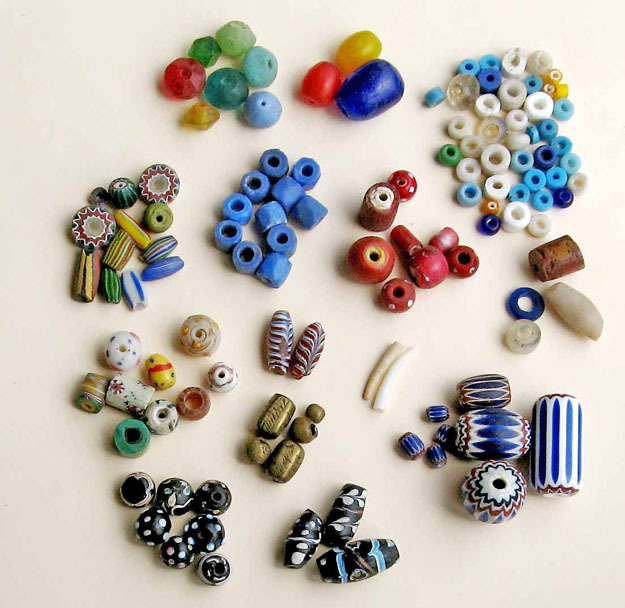 China was also a source of glass trade beads. Studies by Peter Francis, Jr., Director of the Center for Bead Research, has shown beads from China were brought to Mexico with the Spanish galleon trade. This trade route linked Chinese ports with Manila and Acapulco, and from there to the rest of the Spanish Empire in the Americas. Russians acquired Chinese beads from trading post on the Mongolian border and transported them to Alaska. A few Chinese glass beads have been found along with Venetian beads on Colonial Spanish 17th century sites…one of America’s top archaeologist, David Hurst Thomas excavated over 62,000 beads from St. Catherine, the northern most Spanish mission on the Atlantic coast. The word “bead” is derived from the old English word “bedu” meaning prayer. The aristocrats of the glass beads were the Chevron or Rosetta beads; they are also called Rosary or Star beads. These Paternoster beads are multi-layered and corrugated to produce a star pattern on the ends which often result in stripes on the outside. 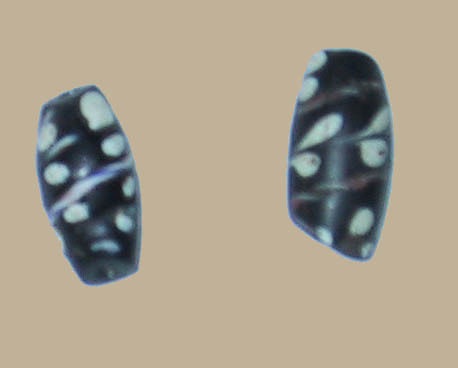 The original Chevron bead had seven layers. This hand-faceted bead was difficult to make, and in order to meet the demand, variations were made with as few as four layers. These new variations were tumbled instead of being hand-faceted to speed-up the process. The most common Chevrons are the blue, red, and white combination. Green and white, or red and white, chevron beads are rare. Father De Smet carried these beads in his work with the Plains and Northwest Indian tribes, but there is no evidence Chevron beads were used during the Indian fur trade period as a trade item. Prior to European contact, beads in North America were made from gold, silver, jade, bone, the blue-green turquoise, and hand polished shell beads. Anasazi, Fremont, and other Southwestern Pueblo people traded turquoise throughout the Southwest and into Mesoamerica. Indians from the Pacific coast traded sea shells to the Southwest Indians; Indians from the Atlantic coast and the gulf of Mexico traded beads to the Mound Builders of the Mississippi River valleys. October 12, 1492, Columbus recorded in his logbook the natives of San Salvador Island were given red caps and glass beads. This is the earliest written record of glass beads in the Americas. The Spanish explorer Hernando Cortéz landed on the coast of Mexico in the spring of 1519. His ships carried glass beads along with other European trade goods. The Spanish explorers Narváez in 1527 and De Soto in 1539 carried glass beads for trade with the native inhabitants of Florida. In 1622, a glass factory was built near Jamestown, Virginia. Less than a year later, a raiding party of Indians burned the factory. Very few of the beads made in the Jamestown factory are believed to exist today. Early Spanish Conquistadors and Priests traveled from the Florida Keys to California. In 1741, the Russians reached the coast of Alaska and from there down the western coast of North America. A North West Company trader, Alexander Mackenzie, crossed Canada to the Pacific Ocean in 1793. All of these explorers, as well as David Thompson and the Lewis and Clark Expedition, carried glass beads for presents and as a medium of exchange in dealing with the American Indians. Bead prices varied with location, demand, and how bad Indians wanted a particular bead. When trading for beaver pelts, the Hudson’s Bay Company used a standard value based on made beaver…a made beaver was stretched, dried, and ready for shipment. 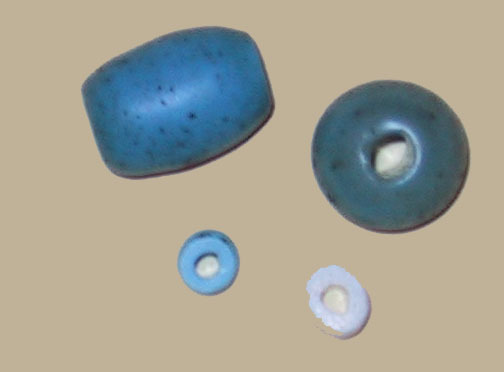 Records from early trading posts show a made beaver was worth: six Hudson’s Bay beads; three light blue Padre (Crow) beads; two larger transparent blue beads. Little historical information is available on the majority of trade beads discovered in archaeological sites. The Hudson’s Bay Company has celebrated over three hundred years in North America, but the records on types and descriptions of trade beads, along with invoices, and sources of supply have not survived in the Hudson’s Bay archives. Today the company’s only examples of the Hudson’s Bay beads are in the Indian Arts and Crafts section of their museums. Padre beads are wound, opaque, light blue glass beads from China.These beads come in three sizes: jumbo (Dogons) 5/8’s to 3/4 inch in diameter, mid-sized (Crow beads) 3/8’s inch in diameter, and small Pony beads 3/16’s inch diameter. Through Spanish and Russian traders, Padre beads spread rapidly into the Southwest and Northwest. In 1778, English explorer, Captain James Cook made several references to the effect it was difficult to obtain supplies and furs from the Pacific coast Indians without this particular blue bead. Captain Lewis had this to say about Padre beads and the Indians tribes along the Columbia River…only the blue and white beads were acceptable, the most desired, are the common cheap, blue beads called “Chief Beads”…. Padre beads were made in a variety of colors, but blue and white were the most sought after by the Northwest Indians. Another trade bead was the Vaseline, or Cave Agate. 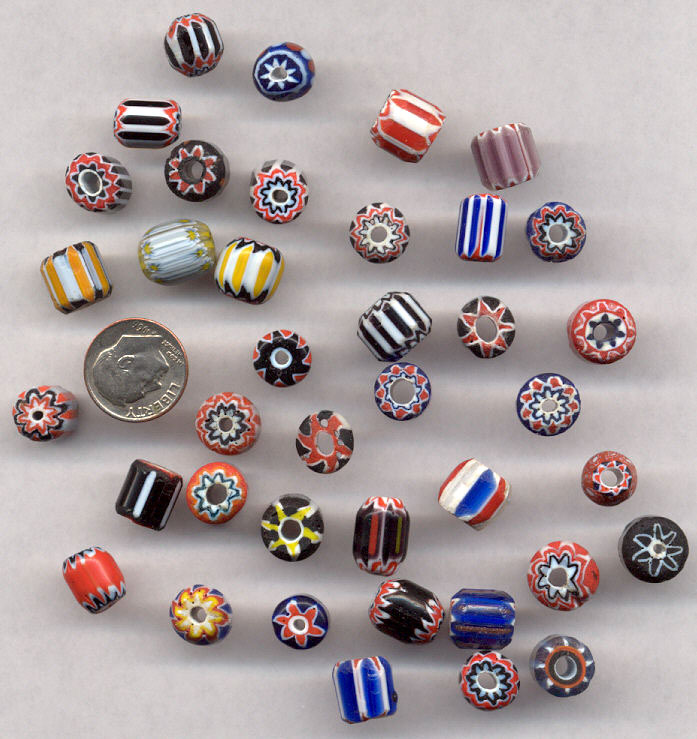 These beads range in a variety of colors. This pressed bead was faceted and transparent. 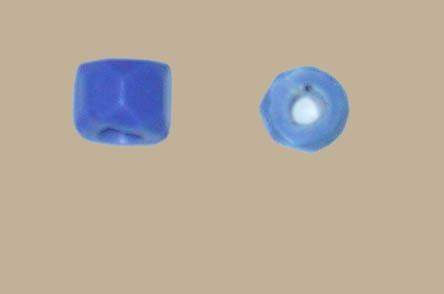 On the earliest Vaseline beads, the hole through the bead is larger on one end; the hole was made with a hot pointed rod. Vaseline beads were widely traded until the mid-1800. After the mid-eighteen hundreds, Indians women requested the smaller seed beads. Russians had little to do with the Russian Blue beads. Produced in Bohemia, the Russian Blue bead did not appear in Alaska until just before Americans bought Alaska (1867). Russians traders acquired these beads from the American and English traders in exchange for furs. The Russian Blue beads are shaped into six-, seven-, or eight-sided tube before being drawn. After the tubes are cut to bead size, the ends of the ridge between the adjacent sides are ground off. Produced in Bohemia, the Russian Blue bead did not appear in Alaska until just before Americans bought Alaska (1867). Russians traders acquired these beads from the American and English traders in exchange for furs. The Russian Blue beads are shaped into six-, seven- or eight-sided tube before being drawn. After the tubes are cut to bead size, the ends of the ridge between the adjacent sides are ground off. The result is a bead with eighteen, twenty-one, or twenty-four facets. Some deviations resulted in more or less facets. The Lewis and Clark Expedition carried thirty-three pounds of small trade beads. 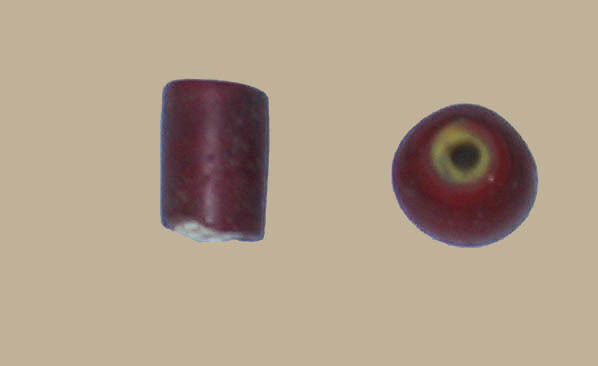 There is no evidence they carried the bead pictured to the right, but these beads are known as Lewis and Clark beads. There are several entries in the various journals kept by the Expedition members about how hard it was to trade for food with any of the beads they carried, except the plain blue and white ones. In the mid-1800’s, the “Cornaline d’Aleppo” beads became known as the Hudson’s Bay bead. This bead has two distinct colors of glass, one color over the other. The outer layer was red and the inner layer a translucent green. The more recent version of the Hudson’s Bay bead has a yellow or white center of opaque glass with the outside having a translucent or opaque red glass. This later version can be found in tubular, ovate, and spherical shapes and in a wide range of sizes. The last known bead made for Native American trade was the Hubbell bead. This bead was supposedly made for Lorenzo Hubbell owner of the Hubbell Trading Post in Gavado, Arizona…records at the Hubble trading post do not support any connection with this bead. First made in Czechoslovakia between 1915 and 1920, this bead is still being made today. The Hubbell bead came in a variety of sizes, shapes, and shades to imitate a semi-precious stone…Turquoise. 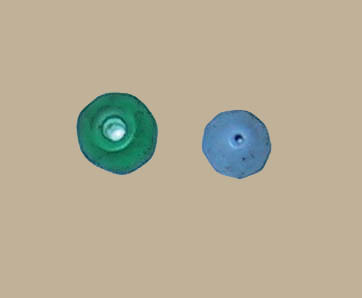 Southwest beads, especially turquois, were widely used as a trade item with Meso-america. 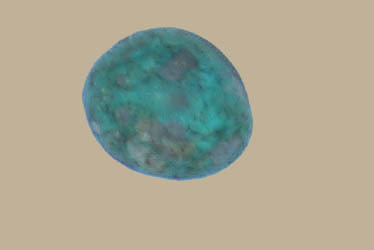 Southwest turquoise has been found in the Plains area, and along the Pacific Coast. The Southwest Indians are still making turquoise jewelry. Several varieties of beads are in use today in jewelry and decorations. This string of jumbo Padre “Chief” Beads was a gift from Julie Birrer of Jackson, Wyoming. The beads original came from the Nez Perce in the late 1700s. 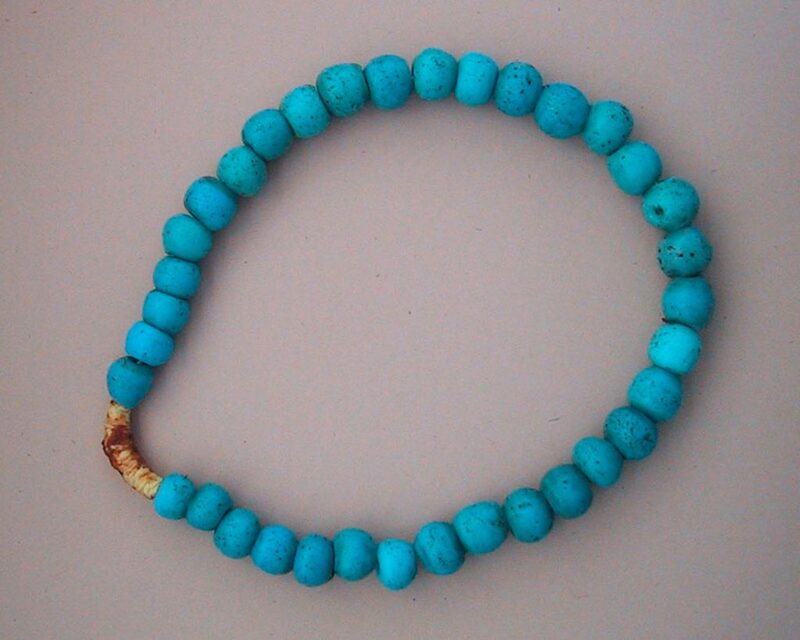 The Nez Perce referred to these beads as Sky-Blue beads. This thirty-five inch bandolier went around a horse’s neck. While on his way to the Columbia River and Fort Astoria in 1811, Wilson Price Hunt mentioned a similar decoration on a Cheyenne Indian horse’s neck. This pre-1885 Crow bandolier has on it: Crow beads, vaseline beads, French brass beads, white hearts, Mescal seeds, sea shells, Abalone shells, Dentalium shells, Dutch Dogons, watermelon beads, hawk bells, thimbles, buttons, rifle shell casing, bullets, deer dew claws, and a pieces of an American flag. Many history books claim the Dutch bought Manhattan for twenty-four dollars worth of trade beads. This story first appeared in Martha Lamb’s book on New York history in 1877, which was two hundred and fifty years after the purchase. Since her book was published, most historians have quoted it. Manhattan was purchased with trade goods, but there is no evidence trade beads were more than a small part of the exchanged items. – Peter Francis, Jr. Bead Research Center. 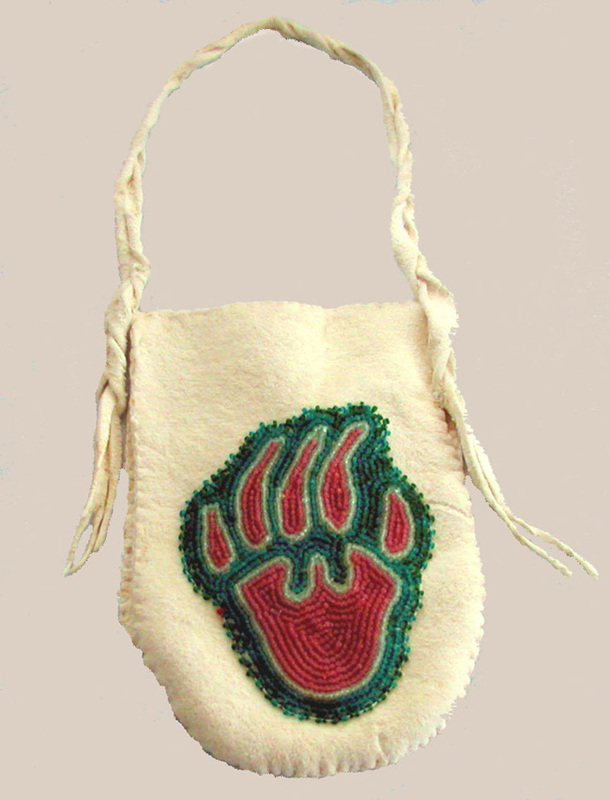 Seed beads like those used on this deer skin bag reached the plains Indians in the mid-1840s. Prior to the introduction of seed beads, porcupine quillwork was used in decoration by the Plains Indian women. Developed by the North American Plains Indians, quillwork followed the introduction of horses. After acquiring horses, Plains Indian did not have to range over larger territories in search of game. Being able to spend more time in one place allowed women time to quill. Each tribe had its own patterns and traditions associated with the quill work. This strip of seed beads belonged to Carrie Bagley. Her daughters Helen Yeaman and Betty Frome gave it to me. 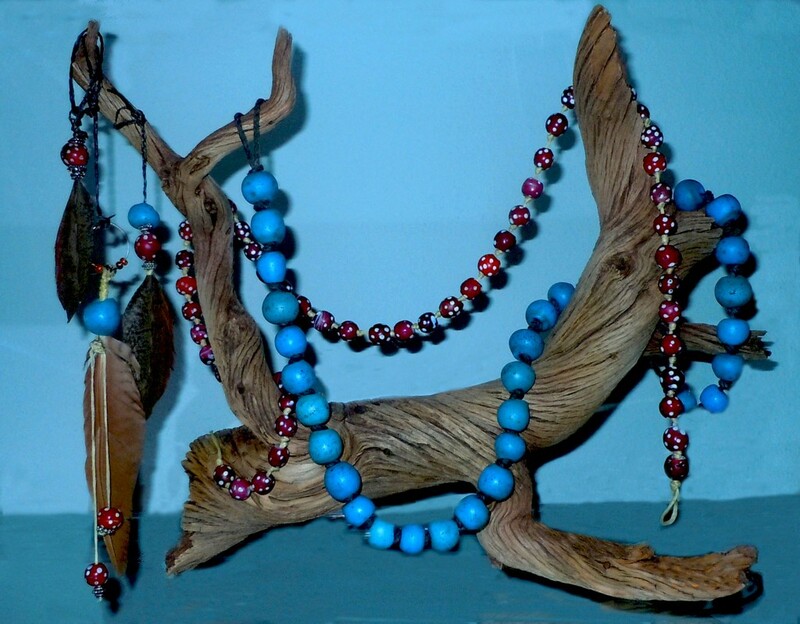 The primary beads used by Indian women for decoration were the seed, Pony, and Crow beads. Made of drawn glass: the seed beads were under 2.0 mm; Pony, or pound beads, were between 2 and 4 mm; Crow bead were 4 to 10 mm in diameter. The larger Crow and Pony beads were carried by Lewis and Clark and other early explorers. Crow and Pony beads were hung from, or attached to clothing and horse gear. 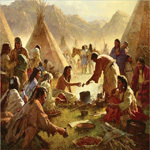 There is no evidence of seed beads being taken to the Mountain Man Rendezvous during the period 1825 to 1840. My thanks to Joan K. Murray, Corporate Historian, HBC Heritage Services for information on Hudson’s Bay seed beads. In 1987, the Hudson’s Bay Company sold its Northern Stores Division to the North West Company. The successor to the Hudson’s Bay Company in Northern Canada still sells beads to Native Americans. The new North West Company stocks over forty colors of seed beads. Native Americans along the eastern coast had their own beads. These beads were made from the “quahog” or hard-shell clam. 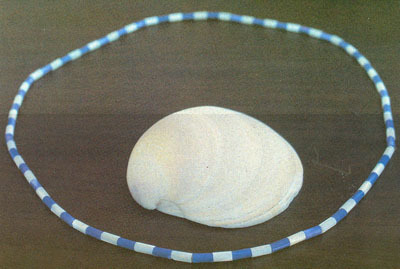 The hard-clam furnished two colors of Wampum—white and purple. Only a small portion of the shell could be used to make the purple bead, resulting in its value being twice the value of the white bead. With the introduction of metal tools to drill and work the clam shell, the beads became more uniform, about one-fourth inch in length and one-eighth inch in diameter. The Dutch and English colonists established factories to speed up the production of Wampum, thus becoming one of the earliest industries in America. John Campbell and his descendants in New Jersey made the bulk of wampum beads traded in this country. Quahog-shells were also sent to Europe to be made into Wampum and then returned to the colonies. Wampum beads were widely used for trade, but were not considered a form of money. These beads were used for personal decoration, and when arranged on a string in a particular color pattern to convey messages between various tribes. Wampum woven belts were often used in ratifying treaties. The arrangement of colors becomes the treaty document. There are records of court judgments and tuition in some of the early American colleges as being payable in Wampum. Beads of the quahog shell remained a medium of trade exchange until 1792, when the United States government established coinage laws bringing into use the first silver dollars and ten dollar gold pieces. Glass beads eventually replaced Wampum as a means of ornamentation. Note: I wrote this article and the others on this site because I wanted to know about a particular subject. I am not, nor do I claim to be, an authority on anything…only an inquisitive curiosity. Some so-called “authorities” have complained about the chevron beads in the above pictures. The chevrons at the bottom of the picture were bought in Germany after World War II, but most of the other beads in the picture appear to be much older……as far as I know, there is no way to accurately determine the age of glass beads, or when and how they were used. Despite the large numbers of beads found in some archaeological sites, there is little historical information available on the majority of the beads found. The Indian Trade Bead article was written by Ned Eddins of Afton, Wyoming. This is an excellent post. I am sorry the writer did not leave his or her name. Prior to the introduction of glass beads to the cultural expression, the Indigenous People of the Great Turtle Continents used their own forms of decoration (i.e. quahog beads). What other sources of beaded decoration were commonly in use? Seashells, hollowed bone, the claws and teeth of brothers, small stones, tortoise shell? Bead traders offered what exactly: status, reduced labor, attractive alternatives, greater diversity or range of style, texture, color? Materialism is a cultural characteristic of the European? It is not understood to be a characteristic of the Indigenous People. Functionalism is the characteristic of the people. What assumptions did the ancestors have about these new beads? What conflict between the material society and the functional society led to the raid on the Jamestown glass works? What identity was affected most by the discovery of the glass works? What assumptions were altered? Reply: I have no straight-forward answer to the points raised by these questions, only a good share of world history is one people changing, or destroying, another people’s culture. One excellent point brought out is the materialistic Europeans and the functionalistic indigenous people. This was maybe true in the beginning, but once European goods, especially horses, were introduced some Indians accumulated more “wealth” than others. But, and this was true for most tribes, leaders were picked for their generosity, and in most cases, were relatively poor. A far cry from the leaders of today’s materialistic society where many of them use their positions to accumulate wealth…not give it away. Noticed the reference to the effect that indigenous peoples were not materialistic. Here on the west coast that does not hold true. The tradition of the Pot Latch is about materialism. Pot latch was a tradition among N W coastal tribes of giving gifts to neighboring tribal chiefs to impress them of the wealth of the giver. It was practiced in post historical and Prehistorical time to a great extent. A tribal chief may impoverish himself to impress another chief. At one time the practice was outlawed. These peoples also raided neighboring tribes capturing people to be slaves, to be traded, or sold. In these tribes MORE WAS A STATUS SYMBOL. Browsing your web site was very interesting. You did a very nice job of putting together. Regarding your statement “little is known about Hudson’s Bay Fur Company trade beads.” Contrary to what you may believe to be true is not true at all. Much work has been done on the old Ft. Vancouver site. In excess of 100,000 beads were pulled from that one area. There existed, in these beads, over 152 varieties of beads. I myself have numerous strands of beads from the Columbia River Plateau and Columbia River. Some are in our personal collection, some are for re-sale. My point is, much work has been completed on the Snake and Columbia River. The Snake River is our counties northern boarder. The Columbia River is our western boarder. We are surrounded by over a dozen Native American Indian reservations. We have gained much knowledge from these people and have traded with them for numerous beads. My husbands father was raised on the Colville Reservation here in Washington State. He fished at the old Celilo Falls before the dames were put in. You can check in at Burke Museum, University of Washington at Seattle and view dozens of colored photos of Northwest beads. You can type in your search “hbc ft. Vancouver trade beads” You will find an abstract of the work performed on that site and another nearby site. Also, there is one color plate of beads taken from that area. A man by the name of Lester A. Ross has numerous colored photos, but for some reason is reluctant to share them with some folks. Robert Liu, author of Collectable Beads has looked at Lester Ross’s beads and has looked at our beads. In his opinion the beads are all same. There are many beads that look like they just came out of the box. What most folks don’t understand is that the Native Indian peoples took very good care of their beads. Unlike Africans who wear their beads everyday, the Indian man or woman wore their beads for a particular ceremony, then went home and hung them up. Again, unlike African people who cover their beads with a lot of body oil. This must be the statement Mr. Sumerlin is referring to: The Hudson’s Bay Company has celebrated over three hundred years in North America, but the records on types and descriptions of trade beads, along with invoices, and sources of supply have not survived in their archives. Today the company’s only examples of the Hudson’s Bay beads are in the Indian Arts and Crafts section of their museums. The beads are here, what is missing is records of how and when the beads got to America, or even Ft. Vancouver. Not all traders in the Northwest worked for Hudson’s Bay, i.e. Astorians, McTavish and those off of trading ships. Wind River Rendezvous, St. Stephans Indian Mission Foundation, St. Stephans, WY. Bead Research Center – Chinese Glass Beads: A Review of the Evidence by Peter Francis, Jr., Director of the Center for Bead Research. To reach this internet site, type into Google search- the bead site – and it comes up as Index-2, otherwise you are asked for name and password. Native American Beadwork – Large Bibliography of Native American Beadwork. Mindy Callaway, Graduate School of Library and Information Science, University of Texas at Austin. www.hbcheritage.ca – HBC Heritage Services is a good source of information on the Hudson’s Bay Company.